The Zacurate Pro Series 500DL Fingertip Pulse Oximeter is manufactured according to the CE and FDA standards set for pulse oximeters used by doctors and other health professionals. 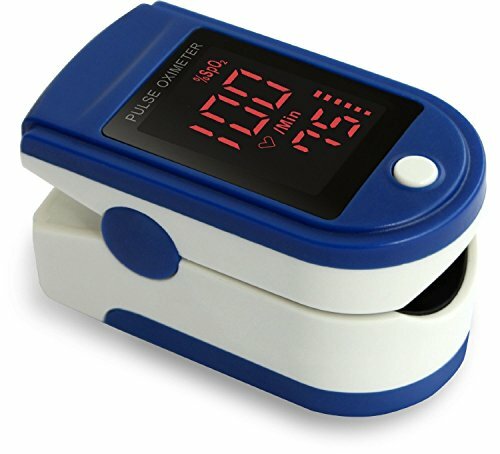 Designed for sports enthusiasts, pilots or anyone who wants to obtain their SpO2 (Blood Oxygen Saturation Levels) and PR (Pulse Rate) on the go, the pulse oximeter LED display now faces the user so that the user can read it easily. We have also upgraded many internal hardware and software components of the pulse oximeter. For example: The pulse oximeter can now SpO2 up to 100%! Taking a reading is easy, just clip it onto your finger and turn it on at the press of a button. The large LED display makes viewing the results a snap. Its small size makes it easy to carry around and a lanyard is also included for added convenience. Comes with 2 AAA batteries and a silicon cover to protect your pulse oximeter from dirt and damage. Comes with 1 year manufacturer warranty. Terms and conditions apply. Please refer to the manufacturer website for more info. ACCURATE AND RELIABLE - Accurately determine your SpO2 (blood oxygen saturation levels), pulse rate and pulse strength in 10 seconds and display it conveniently on a large digital LED display. SPORT/HEALTH ENTHUSIASTS - For sports enthusiasts like mountain climbers, skiers, bikers or anyone interested in measuring their SpO2 and pulse rate. SpO2 and Pulse Rate now faces instead of away from the user for easy read. SUITABLE FOR ALL AGES - Finger chamber with SMART Spring System. Accommodates wide range of finger sizes.